The Treasury Department has suspended investments into federal employees' pensions, as the government butts up against its statutory borrowing limit. 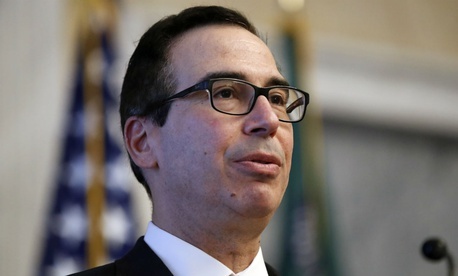 Treasury Secretary Steven Mnuchin announced the step as part of the measures he is permitted to take to delay the government defaulting on its debt. In addition to the Civil Service Retirement and Disability Fund, Mnuchin said in his letter to congressional leadership that Treasury will also suspend investments in the Postal Service Retiree Health Benefits Fund. Mnuchin’s predecessors have increasingly in recent years relied upon “extraordinary measures” to avoid exceeding the debt ceiling. Treasury has typically suspended investments into the Thrift Savings Plan’s government securities (G) fund to buy the government some additional financial wiggle room. On Tuesday, Mnuchin announced he will also “be unable to invest fully” in the G Fund, which is the most stable offering in the federal workforce’s 401(k) equivalent. Treasury last suspended payments to the pension funds in July. Both the pension funds and the G Fund will be made whole upon Congress raising the debt limit. “Federal retirees and employees will be unaffected by these actions,” Mnuchin said. He estimated the “debt issuance suspension period” will continue through Jan. 31, 2018. “I respectfully urge Congress to protect the full faith and credit of the United States by acting to increase the statutory debt limit as soon as possible,” Mnuchin wrote. The Congressional Budget Office recently estimated that if the debt limit remains unchanged, “the ability to borrow using extraordinary measures will be exhausted and the Treasury will most likely run out of cash by late March or early April 2018.” Surpassing the borrowing limit would require the government to delay paying for activities, default on its debt obligations or both. The current debt ceiling is $20.5 trillion, the amount to which it was raised after the temporary suspension of the borrowing limit that went into place in September expired. As the new extraordinary measures take effect, Congress will now have a few months to decide how to avoid a default. In 2011, Congress and the Obama administration had contentious fights over raising the debt limit, leading to the 2011 Budget Control Act. That law created the automatic, governmentwide budget cuts known as sequestration, which began in 2013 and will return to full force this year unless Congress agrees to raise the spending caps.